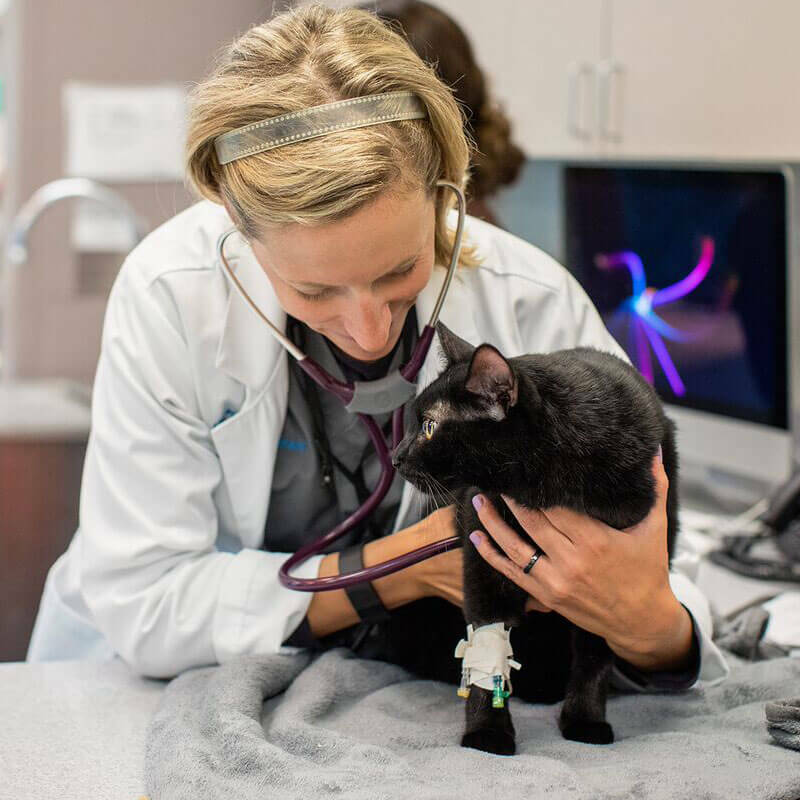 The use of animal blood products is one of the advancements in veterinary medicine that helps save more dogs’ and cats’ lives than ever before. Cat and dog blood banks, like ours, are able to keep up with the demand for blood through voluntary donors. Our growing network of local animal donors (called the Paws of Life team) helps to ensure that pets in the most critical conditions have the blood they need, when they need it. We refer to our cat and dog blood donors as “heroes.” Their gift to fellow canines and felines helps critically sick or injured pets stay alive. As such, we honor these pet heroes on our website. You can read their stories [here]. We also appreciate the time and effort of the pet parents who bring their pets in for donations. These donors and their parents help us maintain a reliable supply of lifesaving blood products for the moments when we need them most. Could Your Pet Be a Paws of Life Hero? To keep donors and recipients safe, donors must meet basic eligibility requirements to be considered. In general, pets must be in good health, be between 1 and 8 years old, weigh at least 50 pounds (for dog blood donors) or 10 pounds (for cat blood donors), receive ongoing preventive care, and have a calm, gentle temperament during veterinary visits. You can read more about specific requirements below. If your pet meets the basic requirements and both you and your pet are ready to help save lives, please contact us today. Pets that meet donor health standards will also need bloodwork and a physical examination (both are complementary) to ensure they are in good health for the donation process. Once accepted into the Paws of Life donor network, we will schedule a day for the first donation. During donation, the pets are the stars of the show. We give them lots of attention throughout the process to keep their focus on having a positive experience. We shave and clean a small area on the neck to prepare it for needle insertion. Once the needle enters the vein, blood flows into a collection bag (very similar to human blood donations). When the donation is complete, we remove the needle, place a pressure wrap, and observe for any bleeding from the donation site. Our team then gives your little (or big) hero lots of treats, love, and hydration. If this sounds like a worthy cause and a good fit for you and your pet, we would love it if you joined the team. If you still have questions about cat and dog blood donation, please click on the links below or call one of our hospitals. Additionally, you can send questions via email to BloodBank@1stPetVet.com or leave a voice message at (480) 889-9965. Dog blood donors meeting the following criteria can safely donate blood every 6-8 weeks, although we schedule donations 13 weeks apart. Commitment: We ask that pet parents commit their pets to quarterly donations for 2 years (4 donations per year). In some instances, we may be able to make exception for those who can only commit for one year. Alternatively, we also need emergency donors (note: we may need to call you at any time of the day or night). Note: We may administer light sedation if needed during the donation. However, most dogs are happy to sit still and enjoy the extra attention from our team. Cat blood donors meeting the following criteria can safely donate blood every 6-8 weeks, although we schedule donations 13 weeks apart. What are the benefits for cat and dog blood donors? How many lives do dog and cat blood donors save? Dogs: could save up to 4 fellow dogs per donation. With donations typically every 13 weeks (4 donations per year), your dog could help save the lives of up to 16 other dogs per year. Cats: could save up to 2 fellow cats per donation. With donations scheduled every 13 weeks (4 donations per year), your cat could help save the lives of up to 8 other cats per year. Ready to Join the Lifesaving Team?